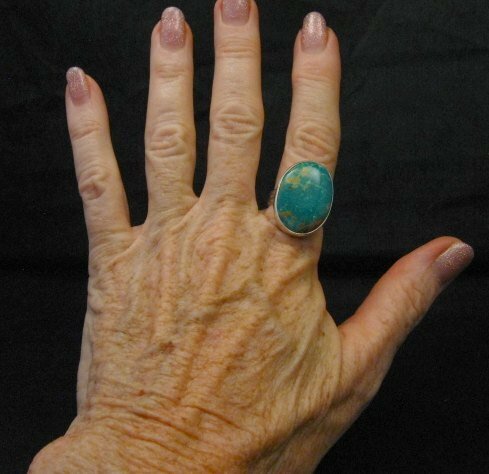 Native American hand made sterling silver Manassa turquoise ring by Navajo artists, Everett & Mary Teller. 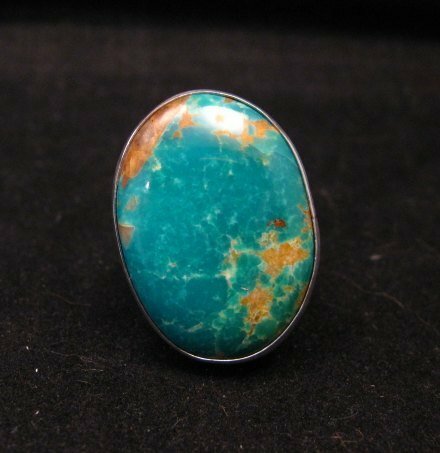 Big beautiful natural turquoise stone 1 inch by 3/4 inch. Size 8-1/2. Item#6925. 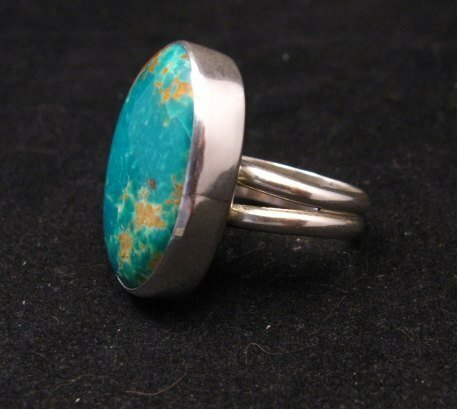 Here is a fabulous sterling silver turquoise ring, created by award winning Navajo artists, Everett & Mary Teller. 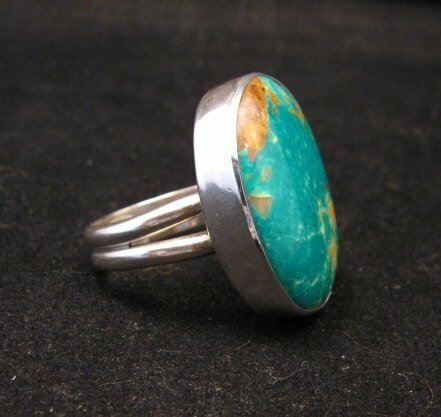 The natural Manassa turquoise stone and the simple deep silver bezel, make this ring a wearable work of art that you will treasure for a long time. King's Manassa turquoise is mined at Manassa in south central Colorado. The Manassa mine is also known as King's Manassa or the King's Mine. Manassa Turquoise is known for its blue-green to green color with golden or brown, non-webbed matrix. This stone is a favorite of silversmiths in the southwest. The Manassa Turquoise mine was originally found by I.P. King and passed down to his son, and then to his grandson and current owner, Bill King. The face of the ring measures 1 inch long and the ring weighs 10.2 grams. Size 8-1/2. Brand new and in perfect condition. Gift Box and Certificate of Authenticity included. Hallmarked by and purchased in person from the artists, Everett & Mary Teller. All of their pieces are signed with their initials EMT encased with a fish symbolizing their Christian faith. About Everett & Mary Teller: These self-taught silversmiths have been making jewelry for over 25 years. They carefully design their pieces and select the stones using a wide variety of natural stones -Turquoise, Lapis, Oyster Shell, Coral, Onyx and more. They show their work in galleries as well as prestigious art shows such as The Heard Museum and Santa Fe Indian Markets.